I’m having fun with this. It’s been awhile since i’ve posted anything and there’s so much to talk about. 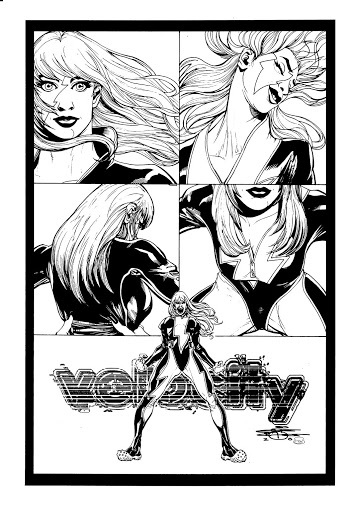 But first.. i’m sure you’ve heard so far that i’m going to be working with Top Cow on Velocity. 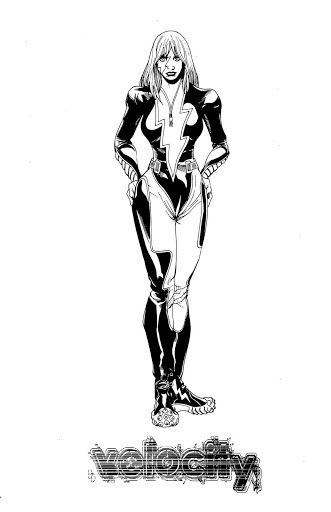 I had never even heard of the character until someone told me that she was a part of Cyber-Force. Like a cold frozen Watermelon smoothie on a hot day. So as i’m nearing the end of my run with BIG CITY, i’ll be jumping on TOP COW. Sounds like a code from my handler. But as you can see, i’ve already started dreaming up a little bit of an upgrade for our fast heroine. That’s the woman and not the drug. Although i can only hope you’ll be addicted with what Joe and I create. 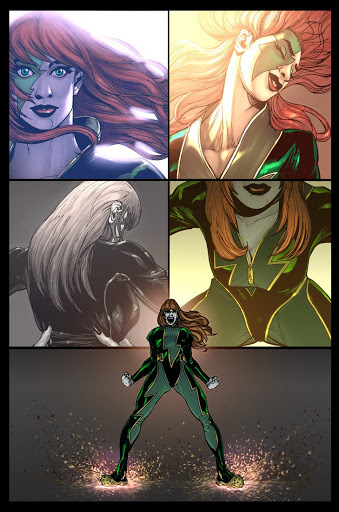 All colorwork on the character studies are being done by Snakebite…colorist whose won many awards for his work on The Red Star. So enjoy the work i’ve put up so far. I ‘ve made great strides with this character already and I’ll be ready for more. It seems i’m getting ready to do a ton of work back in the States again. and as usual… click in the lavenduh, baby. I’ve gotten to a point in my life where i need to start recording people, places and things… because you just never know when the good times or great things will end. 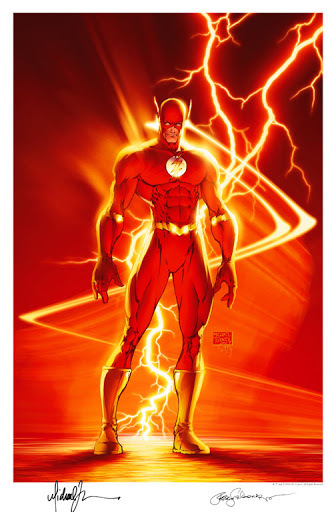 I thought this was the coolest depiction of the Flash that i had ever seen to date. Why? It’s a simple piece, it’s RED… can’t beat that. And can’t MISS that. I was looking for a FF comic and this cover pulled me right to it. I didn’t buy that Flash comic, but i did notice it. Which is what one would go for when paired up against tons of other comics vying for your attention. You can hear the music from the Flash tv series rippling in your head. Definitely made me wanna create. You know earlier when i said that i’ve gotten to the point in my life where i feel i need to record things? I paraphrase of course. But what he said was true. All too soon, the best of what happens in a particular culture of life can be taken away from us. What you have left is the great works on which to pontificate, study and enjoy. 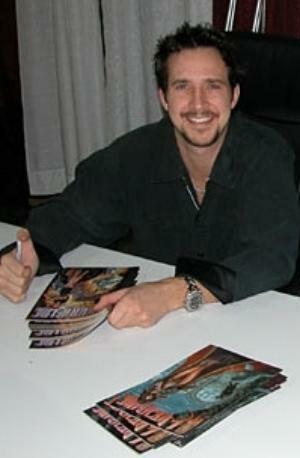 Michael Turner passed away from his battle with cancer at age 37. I come back from the best party i ever threw for myself this weekend to find emails that yet another of our number has passed before 45. All these young cats leaving before we want them to. I wanna say “before their time”, but really… who am i to say that? and affect people’s lives with our spirits while we have the time. I’m sure as i write this, Michael has done this in his own way. In the eyes of his family, in the imaginations of his fans and in the eyes of God. It makes no sense why young people have to die of such an evil, debilitating disease. Why it has to take away the best of us. But God has His time, and we had Michael for a time. I pray his family finds the peace they need during this time. I have never had the chance to meet Michael, but like all secret languages, an artist can look at another’s work and know him or her as if they’ve met on the street and had coffee and an omelette croissant and told each other their stories. Regrettably, Michael’s story was shortened by an unfortunate ending. And his brilliance was …. well.. a flash. God bless the Turner clan. WOULDN’T YOU JUST LOVE TO DO THIS TO A ROTTEN KID?